My first encounter with an electronic calculator was way back in the Dark Ages when a fellow high school student brought this expensive new novelty item to class one day. This would have been around 1973 or ’74. We all gathered around and were dazzled by this marvel of modern technology. You would have thought we were looking at a piece of sophisticated equipment from an Apollo spacecraft! Those under about age 45 or 50 will find it hard to understand that a calculator in the 1970s was akin to the smart phone technology that is all the rage today. Those under about age 45 or 50 probably also don’t understand the Apollo spacecraft analogy. But that is an entirely different conversation. The point is this: to a ‘70s techie, it simply didn’t get any better than possessing, and showing off to your friends, the latest and greatest new calculator! As I remember it, my high school cohort had just purchased his new calculator for about $78.00, a sum equal to around $415.00 today. It added, subtracted, and maybe multiplied and divided—I’m not sure. I don’t believe it had any memory functions. It was as large as today’s netbook and a good 2” thick. Technology has sure come a long way since the early 1970s, and prices have really dropped. $415.00 today would buy you a really nice netbook or even a decent full-scale computer. And a basic calculator can be had for around five bucks! Ten years later, around 1983, I was working in the family business, where I still work today—yet again an entirely different conversation. 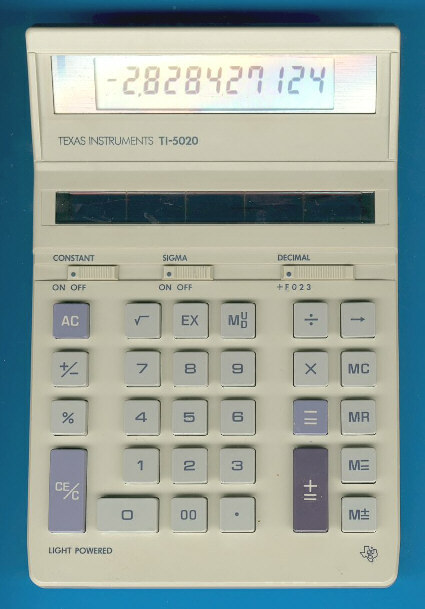 That year, however, I purchased a Texas Instruments TI-5020 calculator. Calculators had come a long way in ten years. This calculator not only does all of the basic math functions, it also has memory functions, a square root key, a “constant” switch, a “sigma” switch (though I’ve never figured out what that does), and a decimal switch to allow for rounding to various decimal places, as well as for doing accounting-style calculating. And, the coolest thing of all: it is solar powered! This old calculator not only still sits on my desk, but it is still my primary calculator, used every day. And I’ve never had to purchase a battery for it. I don’t even think there is a battery back-up feature like newer solar-powered calculators. I have taken it apart over the years to clean it up, to free up the keys from sticky soda residue, and that sort of thing. Once I thought I killed it when it fell in a sink, as I recall. I took it all apart, laid the pieces out on a desk for a couple of days, and then put it all back together. After all of that, it still worked just like new. Indeed, technology has advanced beyond the wildest imaginings of a kid in the 1970s. But one thing is for sure: just like automobiles of old, they don’t build electronic gadgets like they use to. Now, if you’ll excuse me, I’ve got to grab my calculator and balance my checkbook.